If you eat plenty of fiber, you'll be less likely to become obese or to develop diabetes, stroke, heart disease, high blood pressure or digestive disorders like gastroesophageal reflux, reported a 2009 article published in "Nutrition Reviews." Increasing your fiber intake in order to enjoy these health benefits is the basis of the All-Bran diet, often referred to as the All-Bran Challenge. The All-Bran diet may not be a good choice for everyone -- talk to your doctor before beginning. Kellogg's, the cereal's manufacturer, advertises two different types of All-Bran diet: one lasting five days and one lasting seven days. All followers are asked to do is to eat a bowl of All-Bran cereal each morning for breakfast. Any variety of the company's All-Bran line of cereals, including All-Bran Bran Buds, All-Bran Complete Wheat Flakes or original All-Bran can be used with regular or plant milk and topped with fresh fruit, if desired. No other dietary changes or exercise programs are required on the diet. While Kellogg's does not provide sample menus to accompany the All-Bran diet, the Science and Nature department of the British Broadcasting Corporation, or BBC, and Royal Hallamshire Hospital gastroenterologist Dr. Mark McAlindon developed five days of sample meals that adhere to the plan's guidelines. A typical day might feature a breakfast of original All-Bran cereal topped with raisins, a whole-wheat tuna fish sandwich and raw vegetables with dip for lunch and a dinner consisting of a ready-made meal such as canned soup, whole-wheat bread and more vegetables. Snacks throughout the day could be fruit, whole-grain crackers or low-fat pudding. Although adults should consume approximately 21 to 38 grams of dietary fiber daily, most get only 15 grams or less, says the Cleveland Clinic. With a 1/2-cup serving of All-Bran cereal containing up to 13 grams of fiber, the All-Bran diet can significantly increase your intake per day. Because the plan is simple and brief, it's easier than most to begin and stick with. Individuals who don't normally eat breakfast may see additional health benefits -- some research, including a "Journal of Nutrition" study published in 2011, suggests that people who eat breakfast more often have a lower risk of obesity and diabetes. If weight loss is your primary goal, the All-Bran diet may not be for you. 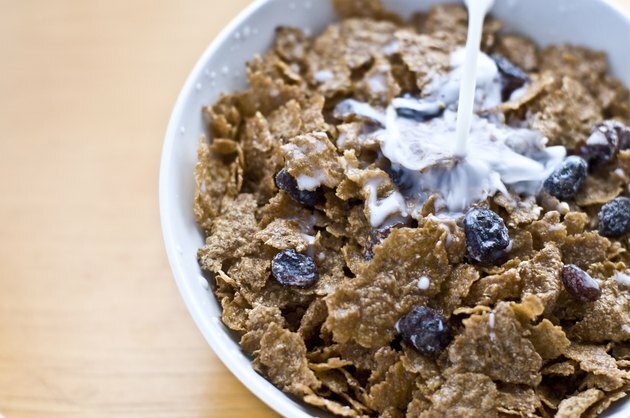 There is no research to support the idea that adding a serving of breakfast cereal to your daily routine will help you lose weight, even if it is a low-sugar, low-calorie, high-fiber cereal. The plan does not encourage the development of other healthy lifestyle habits, such as regular exercise or controlling your sodium intake, avoiding added sugar and trans fats, limiting your processed food consumption and eating more fruits and vegetables. People who aren't used to eating much fiber may find that the sudden increase on the plan may cause diarrhea, flatulence or bloating, though you can minimize these side effects by drinking at least 6 to 8 cups of fluid daily. Since all varieties of All-Bran contain wheat, it cannot be followed by anyone intolerant to gluten.